The Beurer Infrared Heat Lamp is designed to deliver infrared heat to the human body. The infrared heat lamp can be used to treat a variety of different parts of the body such as the back, chest, shoulders, arms and legs. The size of the treatment area covered by the infrared lamp is 11.8 inch x 15.7 inch making it ideal for use on larger parts of the body. All treatment areas should be kept a minimum distance of 12 – 16 inch between the lamp and the body. 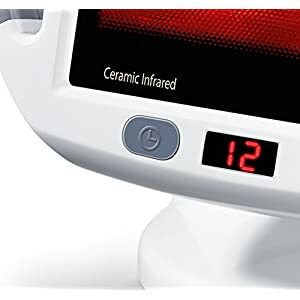 Bronchial Congestion: For the supportive treatment of bronchial congestion, the infrared lamp should be facing the chest area for 10-15 minutes at a time, several times daily. 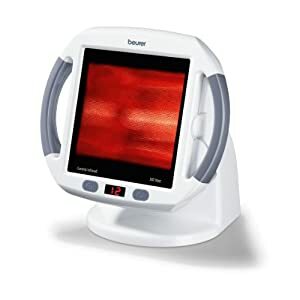 Joint Pain and Muscle Aches: The infrared lamp should face the part of the body that is being treated. It features a powerful 300w infrared ceramic plate with a large surface area of 11.8″ x 15.7″ and 100% UV block. It features a digital timer that can be set from 1-15 mins. The device automatically switches off when the set time elapses. © 2019 Health and Wellness Tips.